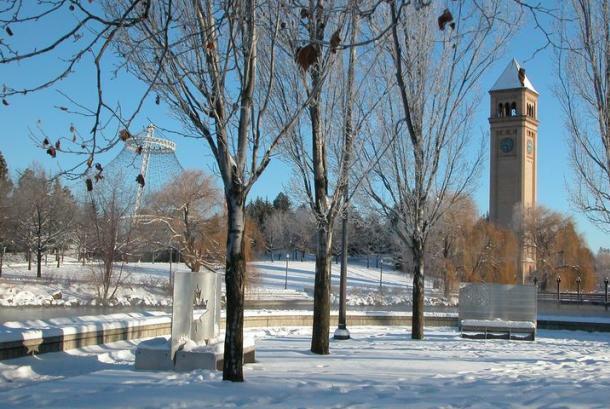 When people think Spokane, they think Riverfront Park. 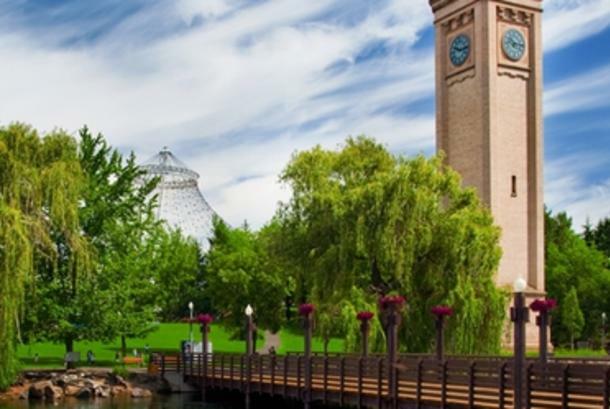 From the thundering Spokane Falls to the towering, historic Great Northern Clocktower to the hand-carved Looff Carrousel, the sprawling 100-acre campus is home to many of the region’s most iconic attractions. Families and friends can spend a whole day touring Riverfront Park. 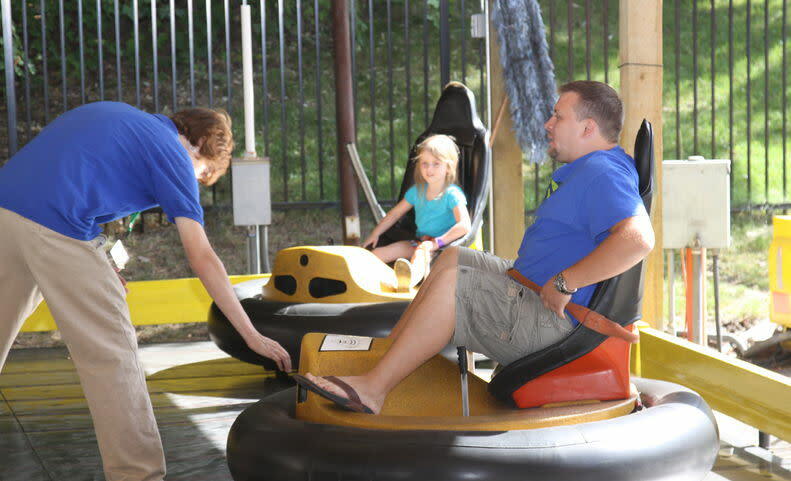 Please note, some Attractions are currently undergoing voter-approved upgrades and may be closed, but there is still plenty to see and enjoy throughout the park! Scenic Beauty The Spokane River flows through the heart of Riverfront Park and the area serves as a showcase for the water’s natural beauty and power. Come spring, the river’s falls rustle through the park. 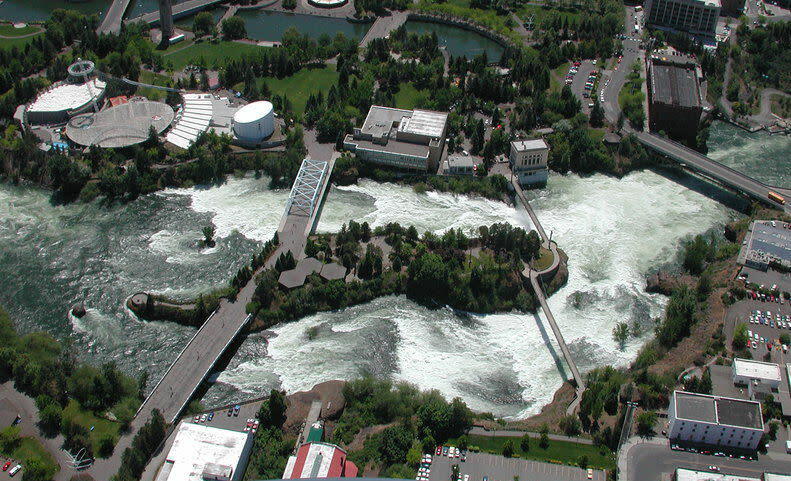 During high flow times in the spring, visitors can literally feel the hydraulic power as the water’s spray can be felt from pedestrian bridges and shoreline vantage points. 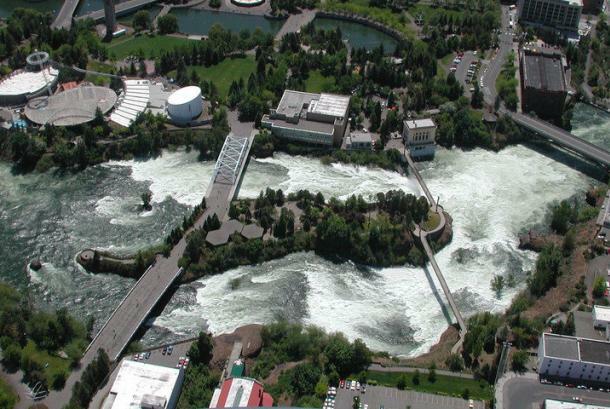 Check out Explore the Spokane Falls for a map of vantage points and restaurants with river views. 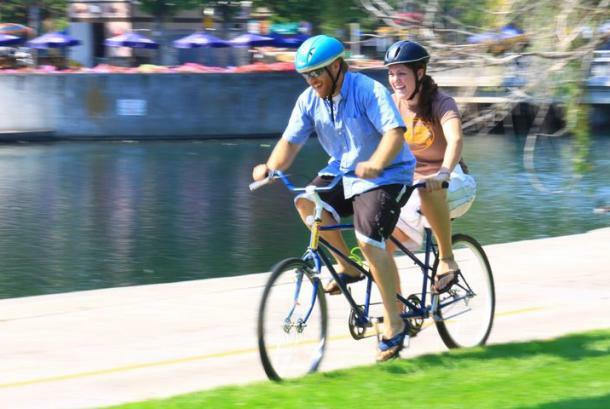 Walking and Biking One of the best ways to enjoy Riverfront Park is to explore the scenic trail system. 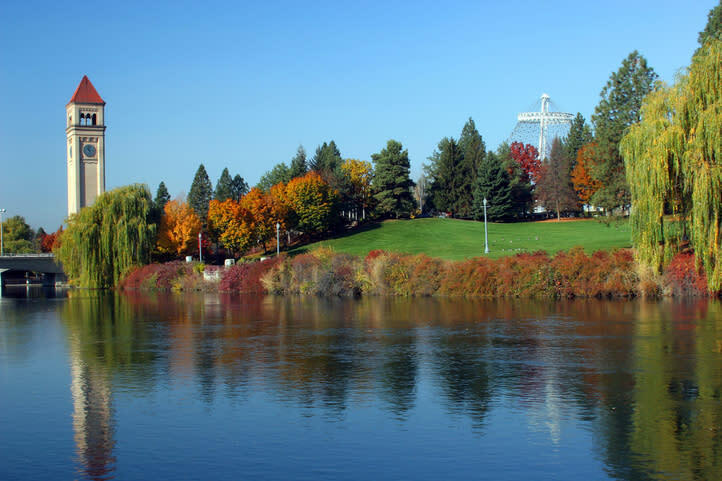 The 40-mile paved Centennial Trail travels through the park, allowing walkers, joggers and bikers to explore the Spokane River for miles in either direction. For a short sojourn, take the trail west from the park. After you cross Post Street, the trail dips below the Monroe Street Bridge for a spectacular view of the lower falls. 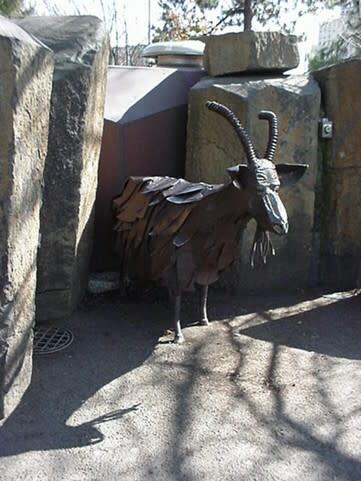 Continue traveling west where you’ll pass shops and restaurants and discover more viewing stations. 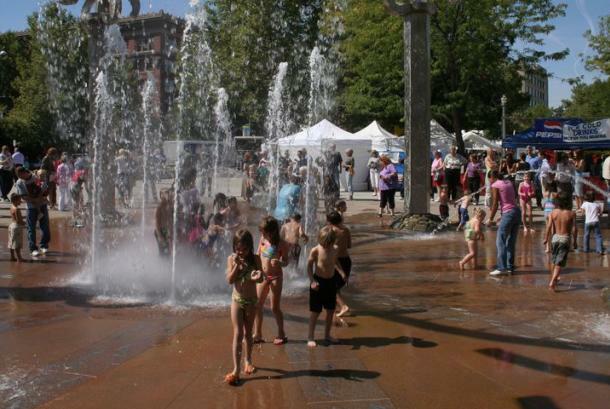 To get even closer to the falls, walk the cascading tiers of neighboring Huntington Park. 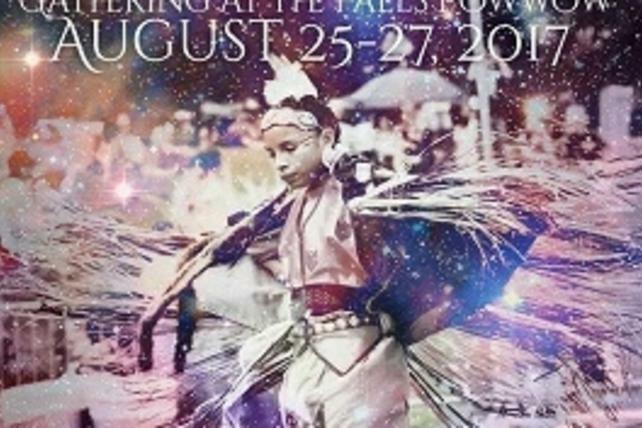 To get there, travel just west of Riverfront Park through the Spokane Tribal Gathering Place adjacent to City Hall. Then, revel in stunning views as the park’s stairs and tiers skirt the roaring water. 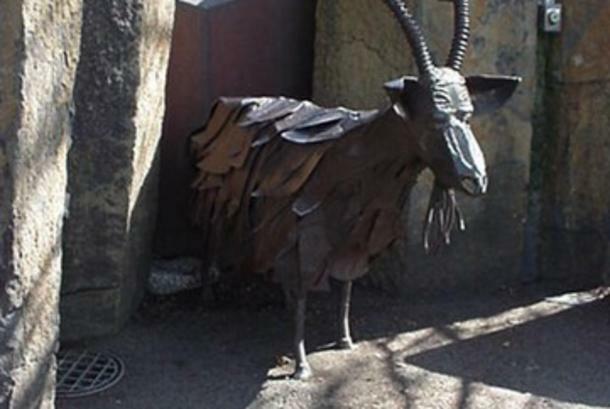 From March through May, the hydraulic force is so powerful visitors can feel the ground shake. 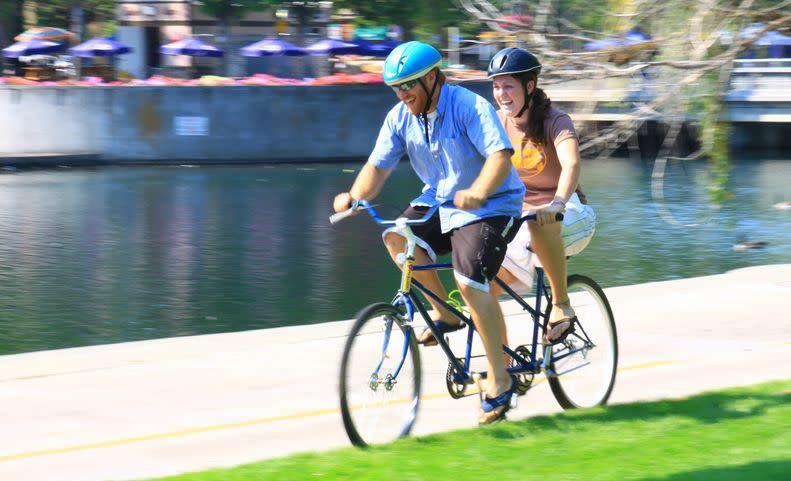 Check out Explore the Spokane Falls to find bike rental shops, guided tours, a trail map and more. 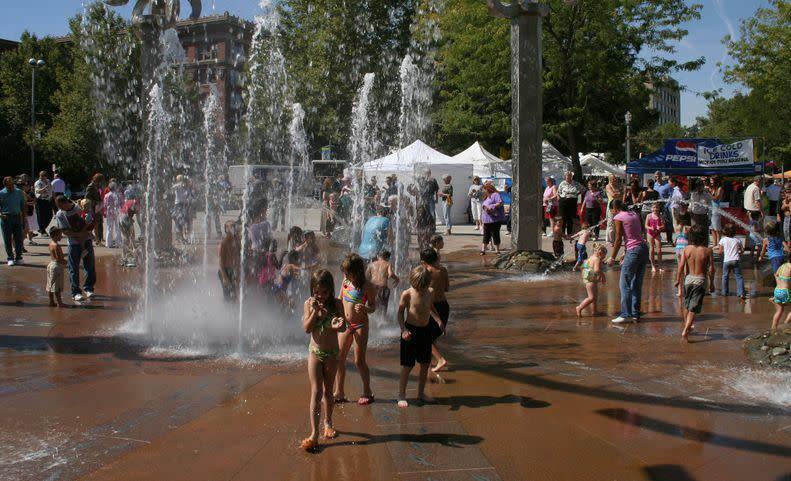 Location Riverfront Park’s central location makes it the ideal attraction for visitors. 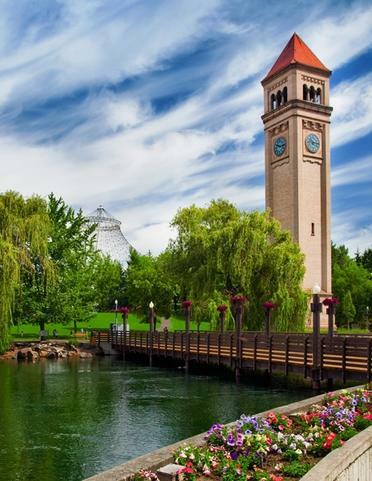 The Spokane Convention Center, River Park Square (our huge downtown mall), dozens of restaurants, award-winning wineries and major hotels all surround the park, allowing visitors to experience the best of Spokane’s shops, restaurants and scenic beauty. Hours: Hours of operation vary through the year and for each attraction. 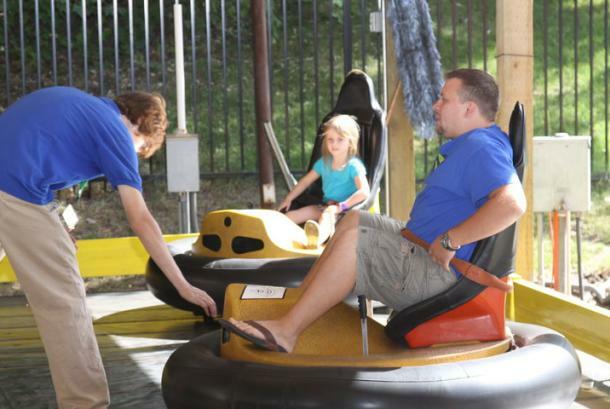 Seasonal Dates: Summer Season approximately April 1st through Labor Day Weekend. Winter Season last week of October through last week of February. 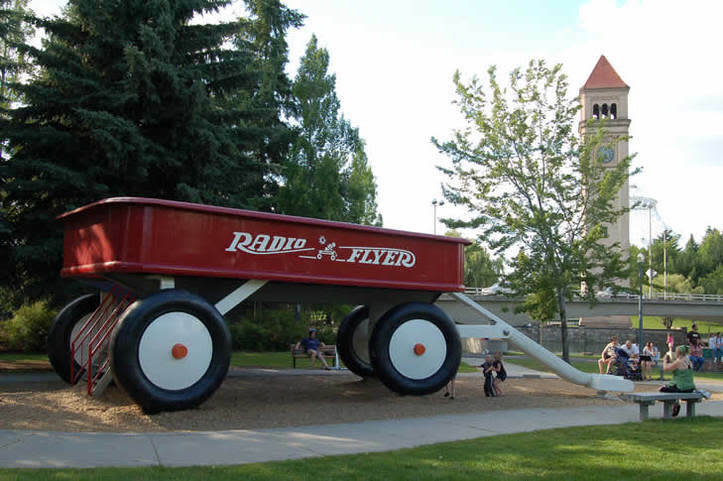 Comments/Notes: Riverfront Park, the site of the 1974 World's Fair, boasts 100 acres of fun in the heart of downtown Spokane. 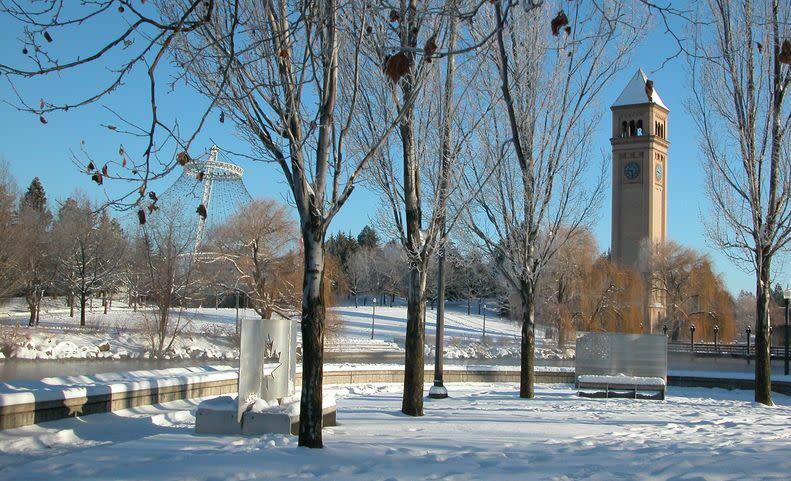 The park features year round events and attractions including the historic 1909 Looff Carrousel, the SkyRide over Spokane Falls, and the Skate Ribbon (open for ice skating in winter and roller skating in the summer). 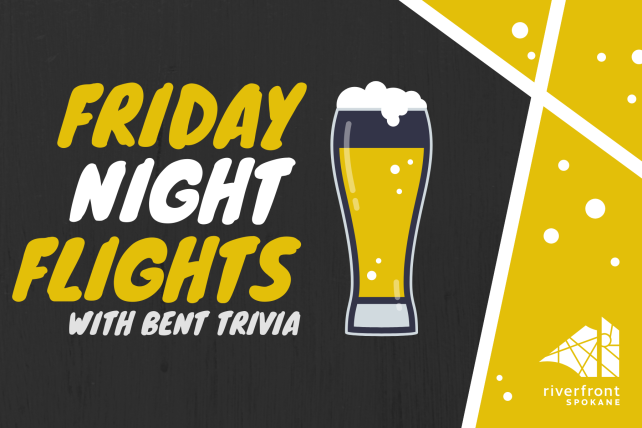 Call or check website for shows and showtimes. Description Explore 100 acres of fun right in the heart of downtown Spokane. 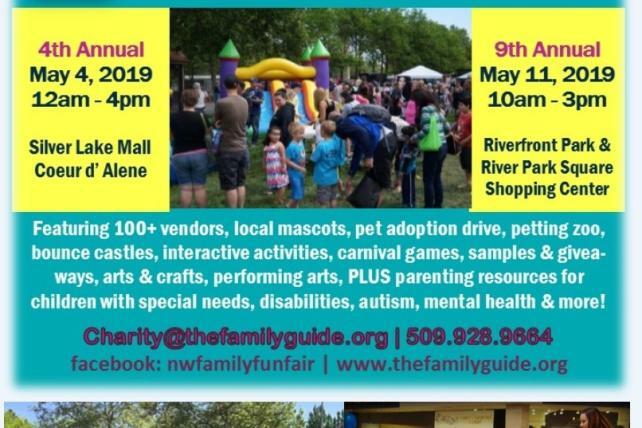 This city landmark features year-round attractions including a new interactive fountain along with a, summer picnic shelters Spokane Falls Skyride, a historic 1909 Looff Carrousel, Ice Ribbon, mini-golf, a restaurant and more family fun.